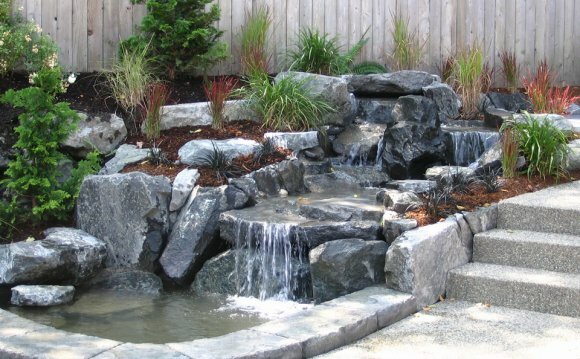 A backyard waterfall will create a soothing environment. The Green Scene in Northridge, CA. Rocks and boulders of various sizes and shapes give these informal waterfalls a natural appearance. Greenleaf Services Inc in Linville, NC. Waterfall BenefitsA waterfall can completely change the atmosphere of your backyard. Falling water produces a peaceful sound that is soothing to the soul. Adding a well-designed waterfall and pond will transform your backyard into a private retreat where you can unwind with friends and family. There are many other benefits to installing a waterfall. First, the constant flow and movement will help to keep the pond water clear and free of algae. Second, a waterfall will aerate the water (add oxygen), which is necessary for growing plants and raising fish. Formal vs. Informal WaterfallsA garden waterfall can be built in a formal or informal style. A formal waterfall is constructed to look like a staircase. Characterized by geometric lines and right angles, formal waterfalls are often made of brick, poured concrete or blocks of stone. An informal waterfall is designed to look like a natural waterfall. It should appear as if you could have stumbled upon it while hiking in the woods. Typically, rocks, boulders, gravel and driftwood are used to build informal waterfalls. The style of your pond, as well as the rest of your garden and your home should dictate the style you select for your waterfall. Waterfall and Koi Pond in Landscape Design by Tharpe.